2. 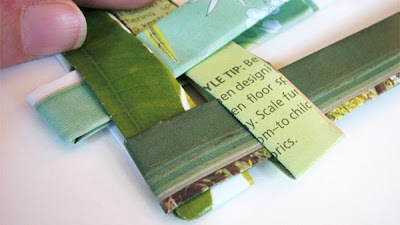 Fold each strip in half lengthwise. 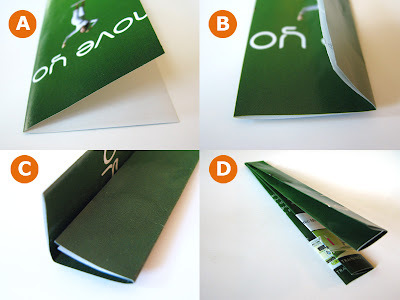 Then fold the resulting piece in thirds, folding the cut edges inward first so they're hidden inside. Now you have a long, thick strip. Fold it in half at the center. See steps pictured above. Repeat with each magazine sheet. 5. Continue weaving. Some strips will wrap around the outside of the coaster when you start them; some will begin sandwiched between two existing strips. See above. Keep adding to your coaster one strip at a time, making sure to push the papers tightly together. Flip your coaster over and check the back frequently to make sure nothing's going haywire back there! 6. When the coaster has 6 horizontal and 6 vertical strips, it's time to finish the edges. 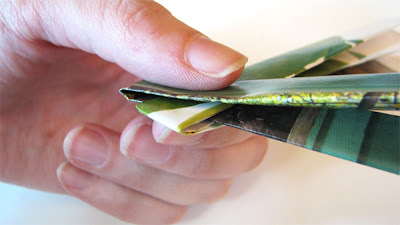 Strips that emerge on the outsides of the "coaster sandwich" need to be secured. Trim off one end of the strip so it's even with the edge of the coaster. Bring the other end around the edge of the coaster and tuck it under the closest weave to hide the raw ends. You should have just enough length to reach. 7. Strips that emerge from the inside of the sandwich can simply be cut off. If you want to seal your coaster with something, you could try some spray acrylic sealer and see what happens. Personally, I don't care if mine gets a little wrinkly from being wet. Happy weaving. I love these. I'm always needing ideas for things to do with my neice and we have tons of magazines. Awesome! 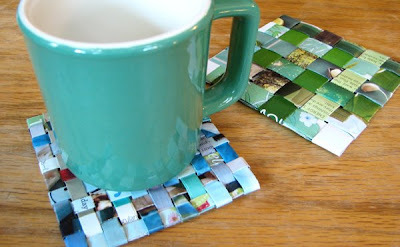 Sweet, I've been looking for a way to make cheap, easy coasters. Thanks for the idea! I've made myself a couple of these. My girls love em. These are great, I love in-front-of-the-tv projects! Thanks tons, I'll be linking. Great idea! I think I might make some of these tomorrow night at my craft gathering! That is a cool idea. I have a zillion magazines... who knows why I save them??? Great idea & technique. This feels like an old Girl Scouts project. I love what Grandma G had to say!!! This is just the sort of craft I've been looking for. Trying hard to save moolah for a house, so trying to not spend $ on craft items. But that leaves me a little bored! I certainly have lots of magazines hanging around! This looks like so much fun! I am definitely going to try this when I get home tonight! I tried it right away and they turned out great! Thanx! Looks like fun! I knew there was a reason I have this huge stack of magazines! I think I'll make some for the girls at work. i think i tried to make this once a long time ago. love love love this idea, going to try tonight during TV hours. thanks again, for sharing! What fun! I'll be making these and the baskets too! I saw these and just had to make one! Posted a pic on my blog. These are just too cute! and when they get really yucky, you can recycle them! i blogged about this. thanks for sharing! I'm making this TODAY! love it! it took me a while to figure this out - and my first one turned out a little skew - but I think it is an excellent idea! Thanks! very cool! my son just got a hat from plastic grocery bags made by our local grandma. Great idea I can now get my daughter off cutting my coffee filters up for snowflakes and get her on my magazines. I love making these in my spare time. My brother moved into an apartment instead of a dorm this year, and I made a set of six for him and his friends as "apartment warming" gifts. Right now I'm making a coaster with the thinner strips. Let me tell you, I will never attempt it again. Thanks for sharing! I'm passing along the word! What a great idea !! I know its just 6-8 sheets of paper, but still its some level of recycling. Thanks.. and please keep coming up with more of such cool ideas. somebody is getting these for Christmas! I just made one and I love it! Thanks so much for the inspiration. These are great!! Fun stuff. I think I'll be making some! i made these for a Christmas gift, but i triple painted it with acrylic paint and sprayed it with gloss sealer. you couldn't even tell they were paper! I like Kristy's idea too. Anyway I goofed mine up and it turned out to be something else! I know what I did wrong so I'll try again, but here's a link to how my first one turned out. Nice stuff. Thanks for that. 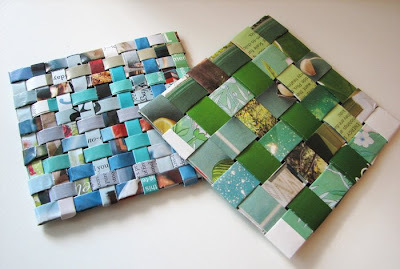 What a great idea..I hate to throw out old magazines..this way I can convince myself I am contributing to the "go green" movement..thanks for sharing..
HI I'm from argentina, I did your coasters and I found it really amazing , it's a great idea , funny and creative !! Congratulations! thanks for the idea, will get to it right away, I have been looking for a good craft to do and thanks to you I've just found it! Great idea! you are so creative person. I love this post! Thank you for sharing these. Hi there! I just spent 2 hours making one coaster and I am so proud of myself. It looks so damn cute! I'm not very good with art but this looked so easy I had to try it. Thank you so much for sharing! Nice! I like the Valentine variation, too. This is a great idea; I made one to send to my brother in a birthday card. Just made 5 of these last night. They are addictive to make. Thank you for the tutorial. Oh, my gosh! Do you know how many magazines I have. Now I have something I can do with the pages I'm not interested in! Thanks think I'll try this! These are like the "sit upons" we used to make out of newspaper when I was a girl scout forty years ago. Darn I am old. Anyway, do you have any idea of the dimensions needed to make a placemat or a a charger instead? 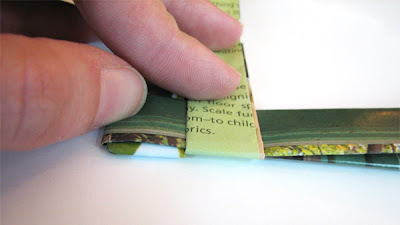 I am thinking I would like to try that with full magazine sized pages. Was so bored and feeling crafty so I made me a coaster! Hi, I tried this...This is cool! Do you mind if I share this on my blog? I'll link it to ur blog of course! Yours turned out so beautifully. I have been "crafting" for almost 50 years and I can't figure out how to keep the strips from slipping out. Maybe if I use Elmer's glue to keep them in place. It seems like no one else had the same problem so I'm puzzled what I did wrong. the l.l.bean catalog would be perfect for this craft, preserving it indefinitely. I decided to make a set of these for a birthday gift. I was making them during a long train ride, and the ticket manager on the train was impressed and really liked them! ive really wanted to make this kind of stuff recently, i think it looks so cool!! :) thanks for sharing! We love this one! 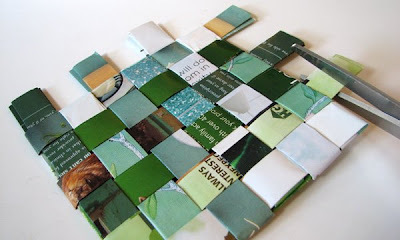 We have posted a photo and a link to your tutorial on our page, the Crafty Artisan. just made a set of 4 of these. They turned out really cute! Not sure if I was weaving as tightly or if my magazine pages weren't as long as yours, but doing 6x6 made a very big coaster with not enough leftover for me to fold the ends in. I scaled it down to 5x5 and they turned out perfectly. I saw one other commenter had the same issue with getting the ends to stay in. Hope she sees this! Just tried this craft today. Did the folding at home and the weaving as a passenger in the car - easy to do while keeping up a conversation. I liked that these coasters let us reuse something from our home that would ordinarily have been thrown out. Takes a little time but they're super cute and low/no cost. Thanks for the instructions! Love this! I need coasters! I'm going to make these tonight. :) Thanks! I made this but it iw difficult to the end. And also this is from paper. How can make it like plastic or sth? It will be wet! These are so cute. The remind me of the "sit upons" that we made in Girl Scouts back in the 60's. Thanks for sharing! great idea !! thanks for sharing !! Such a great idea! I would love to feature this on Reduce, Reuse, Upcycle. Feel free to stop by and grab a featured button. Thanks! First thing to do tomorrow. Great idea! just made a few...i found that heavier duty magazine paper is easier to weave and doesn't slide as much. sealed mine with clear packing tape. thanks for the how to! Would mod podge be a good sealant? Probably not; I've noticed that stuff can get a little sticky when it gets wet. So I tried making the smaller weave coaster and it didn't turn out exactly like I hoped. The paper was difficult to weave toward the end and I found no good way to close and finish it. But it works fine for someone with no money to spend! These are so cute, I can't wait to make them with my kids, but we might add some yarn to hang them with and use them as picture frames. Absolutely beautiful. I just tried and it looks amazing! Thanx !! So beautiful! Can't wait to try it.